What is the name of your band? Hello, we’re Evoke Thy Lords band. What does the name "Evoke Thy Lords" stand for?/ What made you call the band "Evoke Thy Lords"? The band’s name means appeal to awake your own gods. It was originally taken as reference to the Lovecraft works, but since that time the meaning has some changes and there is no unique sense at this moment. Everyone who see our name take out his own sense. Everyone has his/her own gods and music is always one of communication channels with them. I didn’t remember the naming process in detail. How was the band formed? Story of our forming is very trivial – once one guy went to the rehearsal of four other guys searching for vocalist. By the next rehearsal the line-up was decreased to three members. The second guitar and the flute have appeared later, but become essential parts of our sound for a long time. Where are all bandmembers from?/Who does what in the band? Now there are four of us in the band. We got a new guitar player Vladimir and now we’re in search for a regular drummer. Since recording of Drunken Tales there have been three former members so far – our other guitar player Sergey, Irina - flute and Alexey (it’s me) - bass and vocals. We’re all from Novosibirsk, the city in Siberia, Russia. What was the ambitions of the band when you started? We didn’t have any big ambitions, we just wanted to create and play music we like. Since that time nothing has changed. Could you explain your music to someone that haven't heard you? It’s hard to explain, really, cause our music changes radically from time to time. So if we speak about our latest release Drunken Tales, let’s try to describe this stuff something like "Groovy, trippy, hypnotic and deeply thoughtful". Who writes your songs?/ who writes the music who writes lyrics? It’s hardly to call our stuff "songs". It means we don’t have any verses or choruses and our music contains rare vocal parts. Anyway the creation of music is a united process for all members of the band. As for lyrics and vocal parts, they’re up to the vocalist. In practice it turns out that everyone is engaged in his/her part. Who has the best sense of humor in the band? Merry fellows, everyone. Total circus. What genre do you feel you are? I’m not sure about genre… kind of groovy music may be? Some of the reviews labeled us as Psychedelic Stoner Doom/Sludge band. May be they‘re right. Partly, probably and at present. Do you write your own material or mainly covers? With some exceptions for the live gigs we play our own stuff. Playing covers is boring for us. What year was the band started? We’ve been playing since 2002, having started as a melodic Doom/Death band. How old were you the first time you saw a liveband play? In school age as far as I remember. How old were you at your first gig?/Best/worst gig you've played? About twenty. It was in 2004. There are both positive and negative moments at all fests, it’s hard to choose the first and the last among the awesome gigs and among the bad ones too. So, generally, we do a bad impression of a gig because of weak organization and technical problems. What places will you be playing in the immediate future? Nowhere. Now we’re in process of working with our new members so we decided to delay live shows for some time. What are the plans for this year? We’re still searching for the regular drummer but nevertheless we have some plans. In a few words we’re planning to release some stuff but we don’t want to disclose details. Hope that everything will be great. How do you get psyched up for a gig? We do nothing. We always get psyched up. What are your goals with your music? To create the most awesome music we’ve ever heard with strong effect and deep message to the listener. We’re in kind of search of absolute music, I think. Is it easier to get your inspiration from older bands or from bands more modern? I can’t say that we are inspired by music only. Anyway there are both old and modern bands that are awesome. What are your sources of inspiration? Music, ideas taken from books and movies, experience and contemplations. How do you feel about the downloading of music instead of buying albums? According to us we don’t concern the ways fans get our music. If somebody listens to our track one more time we’ll be glad. A commercial element of our band’s activity is always approaching zero. Besides your own music, what genres and bands do you listen to? A lot of. Tagging genres is not easy, as always. Let alone that recently so many bands, for which there is no term to definite their genre, have appeared. So now all musical-genre terminology doesn’t make clear the situation. After all, if I answered your question, I would name Doom Metal, Stoner, Sludge, Ambient and the last bands in my headphones were Arctic ambient from Netherworld and excellent Doom from American band Windhand. What would be your greatest fears for the future? Meaninglessness of existence. When you are on stage, what do you fear most then? Problems with the equipment on stage or that the sound engineer is doing something strange with the sound in the hall. Have you been part of any other projects? As far as I know, noone of us has played in any other projects or bands. Have you been in any other bands? Yes, we all played in other bands in the past. 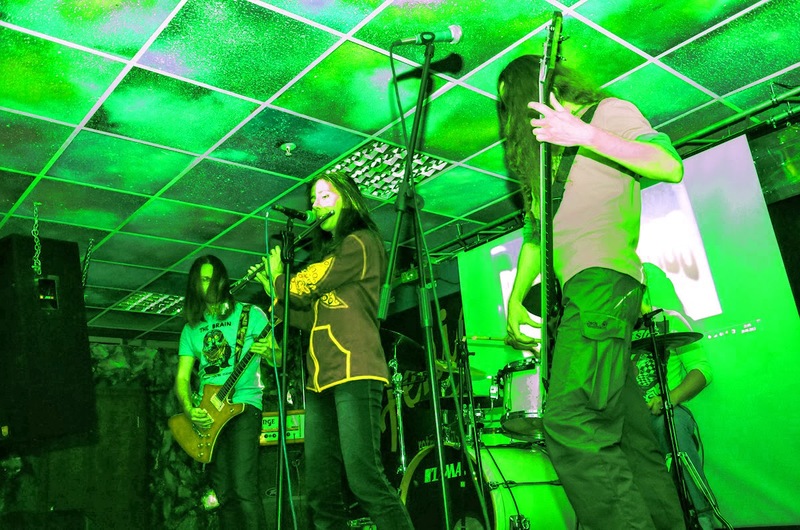 The most worth reporting bands are Collapse (Doom/Death Metal with strong progressive influences, collapsetoall.bandcamp.com) and Emberland (Deathcore/Death Metal, emberland.bandcamp.com). What do you work with outside of the band and the music? We have a nuclear physicist, builder, economist and IT pro playing in our band. We all have regular jobs and don’t make money on our music. How important are your fans? It depends on what we’re talking about. We won’t change anything in our music only to please the fans. On the other hand, we haven’t ever met the Evoke Thy Lords fan with who we would refuse to drink a jug of beer. How often do you rehearse? Once a week, cause we have jobs and we live not too close to each other. Name 2 of your own songs you like at the moment? I always like the latest stuff, so these two songs are very new and still untitled. From our released tracks let it be ‘Routine of Life’ and ‘Dregs’. What drives a band that isn't all that famous and renowned to try to make a living on their music and to keep playing? There are a lot of reasons can be. Our main reason – the wish to create awesome music and express our thoughts in it. Do you have any webpages? Here’s Evoke Thy Lords official webpage: www.evokethylords.com. And you can listen to our music at the bandcamp: evokethylords.bandcamp.com or Soundcloud: soundcloud.com/evokethylords. Also we have Facebook profile: www.facebook.com/evokethylords. Would you like to add anything else? Thank you for your support and interest in our band. And sorry for delay with the answers. Describe your show, visually and musically Hypnotic groovy flow.